Bhí tráthnóna ar dóigh ag grúpa ceoil na scoile le Colm Féirtéar ar chlár ‘Ruaille Buaille’ ar Raidió Highland ar na mallaibh. Bhaineamar an-sult as an ócáid agus ba mhaith linn ár mbuíochas a chuir in iúl do Cholm agus foireann an raidió. Our school music group, under the direction of Bn Uí Ghallchóir, recently enjoyed performing live on air on Colm Féirtéar Gaelic language show ‘Ruaire Buaille’ on Highland Radio. The group used the opportunity to showcase their undoubted talents and to extol the virtues of the school!! Comhghairdeas le gach duine. The show, from 8.30 until 9p.m. 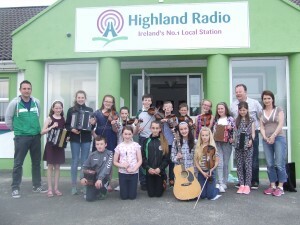 was broadcast on Highland on Tuesday, 7th June and can be replayed on highland radio playback. Tá ár scoil páirteach i scéim náisiúnta ‘Gaelbhratach’ agus d’éirigh linn na spriocanna go léir a bhaint amach, agus ar an ábhar sinn ghnóthaigh muid teastas ‘as an bpáirt dhíograiseach a ghlac muid sa scéim phíolótach’. 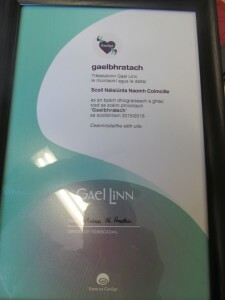 Kilmacrennan NS is participating in a national Gaelic language initiative called Gaelbhratach. This pilot scheme seeks to promote the use and an awareness of the gaelic language through a variety of initiatives. 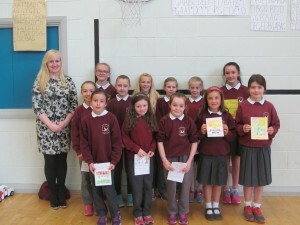 Our school developed the use of informal Gaelic language use, classroom management through Irish, song, poetry and dance through Irish as well as Gaelic quizzes etc. We also significantly increased Irish as a visual language in the environment. We satisfied the criteria of Year One of the scheme and recently were presented with a certificate to mark this achievement. We are the first County Donegal school to receive this national award. Our next target is to strive towards satisfying the criteria of Year Two participation which culminates in the attainment of a flag, ‘an gaelbhratach’.